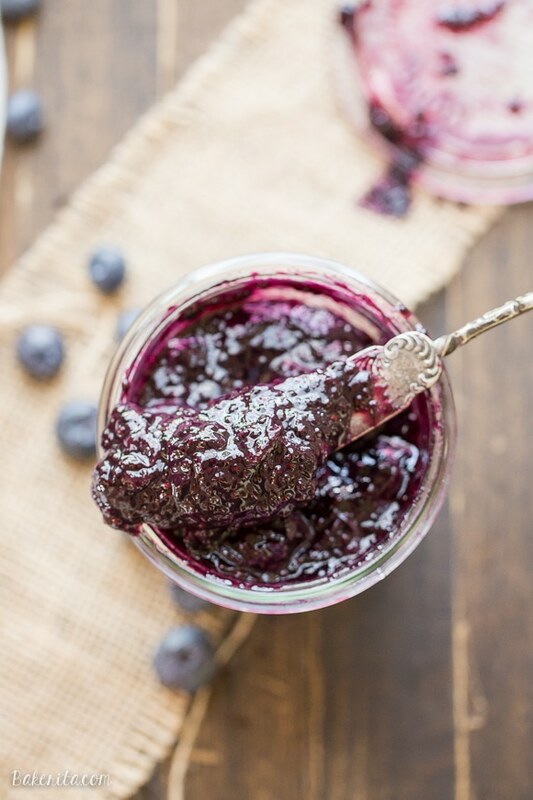 This Blueberry Chia Jam is a healthier homemade jam, made in just 30 minutes! This Paleo + refined sugar free jam is sweetened with maple syrup and naturally thickened with chia seeds. Holy cow, you guys. It’s already August. When did that happen? This summer has been a busy one for me, with moving and traveling, but it feels like it’s flown by in an instant. Thankfully, living in San Diego now, summer lasts for a good part of the year. I can look forward to beach days and warm weather for at least a few more months. Unfortunately, the fresh produce that’s so abundant right now doesn’t last for the next couple months, so I need to take full advantage of it while it’s still around. Blueberries are one of my late summer favorites, and I love how the giant containers are so abundant and cheap in all the grocery stores right now. Is that the case around you, too?! I used to love to go blueberry picking when I lived in Seattle, and would always beg my friends this time of year to go with me, promising them blueberry pies and crisps in return for their help. Here in San Diego, blueberry picking is not as much of a thing, and there’s definitely not free u-pick farms like I had up in Washington. So, instead of picking, I’m buying, but if you have an abundance of berries from picking your own, this recipe is the perfect way to use them. Only 5 ingredients, and you’re on your way to your own homemade jam! 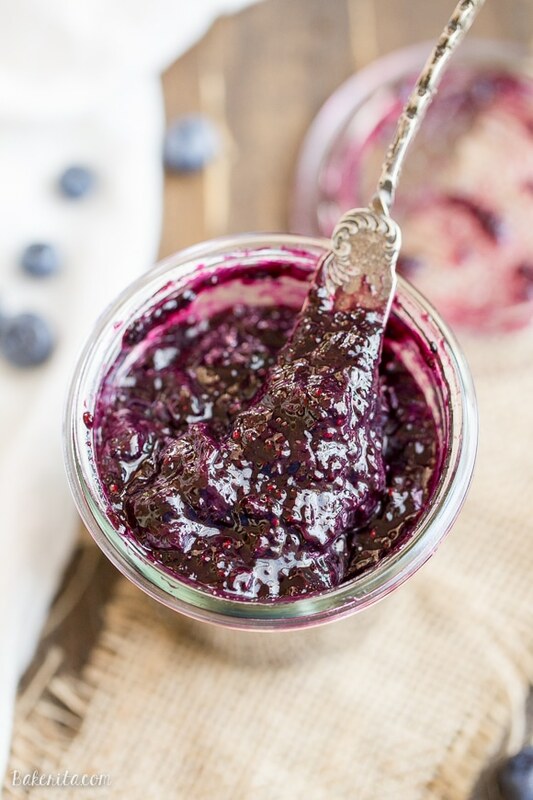 This recipe is a chia jam, meaning it’s thickened by chia seeds instead of any added pectin. The chia seeds add fiber and protein to the jam, and they add a little texture, which I love. Instead of a ton of sugar like most jam recipes use, this one only has 1/3 cup of maple syrup as added sweetener. If you like a sweeter jam or your berries aren’t as sweet, you can up to 1/2 cup maple syrup instead. A little lemon juice and a touch of cinnamon are the other two ingredients. The lemon juice adds a bit of brightness, and tiny amount of cinnamon adds a barely-there warmth that I think rounds out the flavor. In a medium saucepan, combine the blueberries and maple syrup. Cover and bring to a simmer over medium heat, stirring frequently. After about 5 minutes, when the blueberries are starting to break down, add the chia seeds, lemon juice, and cinnamon and reduce the heat to medium-low. Continue cooking uncovered, stirring occasionally to prevent the bottom from scorching, for about 10 to 20 minutes or until the mixture has thickened the blueberries have broken down. The jam will continue to thicken as it cools so don’t let it reduce too much. Let cool completely before transferring to clean jars. Keep in a sealed jar in the refrigerator for 2-3 weeks. It can also be stored in the freezer for up to 3 months. Hi Kyle, I should’ve included that info – I’ll update the post, but it will last about 2-3 weeks in the refrigerator, or 3 months tightly sealed in the freezer. I just love chia jam of any kind! And with fresh blueberries?? I would slather this on everything and anything! Yesss! 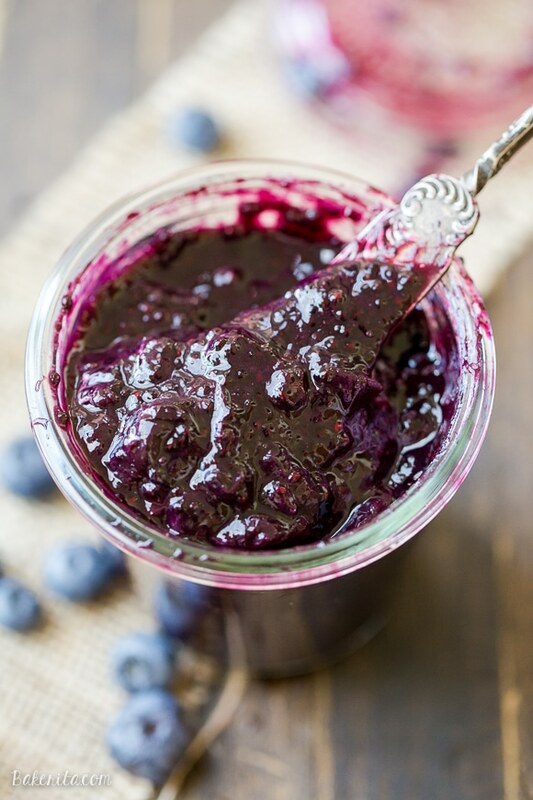 We are totally obsessed with blueberries right now! And totally cheap. I buy them just to freeze for later! 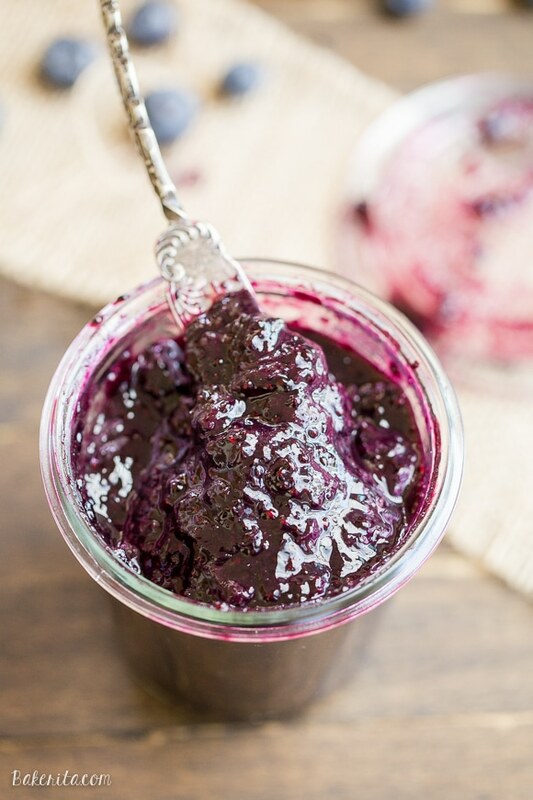 I absolutely want to try this chia jam — I’ve never made any kind of chia jam before! They’re the best this time of year! 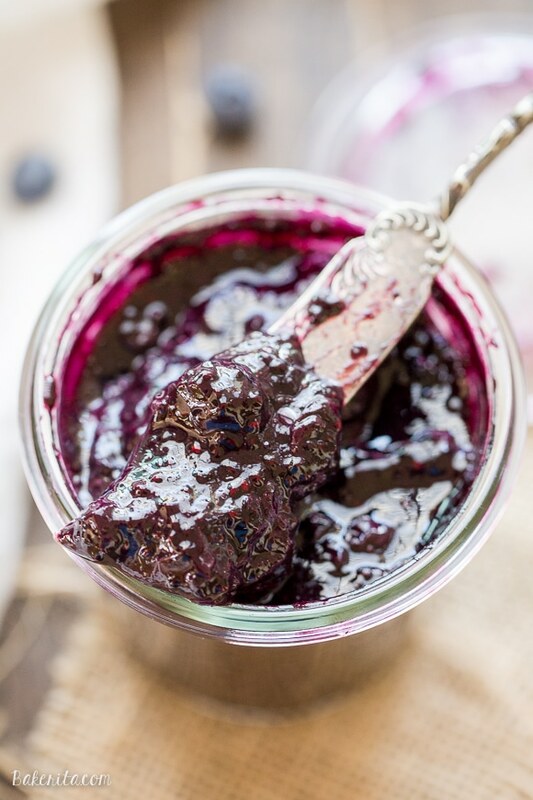 You’ve got to try chia jam – it’s so good and so easy. Thanks so much, Ashley. I am so happy with how cheap the blueberries are right now. This is what I dream about in the summer. And what a great way to use them! I really like that you sweeten this with maple syrup. Right?! It’s the best! Thanks so much, Amanda. I am LOVING blueberry season too! They are so cheap I keep buying 2lbs…per week…my freezer is overfilling at the moment, so I love this idea! This jam looks so simple and delicious! Love love looooove this recipe Rachel! And the photos! Gorgeous. I don’t have any jam recipes on my site but I know if I did they wouldn’t look this appetizing. lol!! Love the chia seed in there! Summer forever! I’ll have to try your version, the maple/cinnamon would be delicious! Hahah great minds, indeed! That’s so funny. Isn’t it the best?! It totally is!! I love how fast it comes together, and how thick it gets with no sugar or pectin added. It’s so yummy! This jam looks absolutely amazing!! I love this color! Could this jam even possibly be any more gorgeous, Rachel?? I mean, I’m totally feeling the need to just grab a spoon and go to jam heaven. Love, love love these pictures too, girl! Is it possible to can this jam to preserve it longer? I am going blueberry picking tomorrow, and plan on picking A TON! Want to be able to put some away for entertaining and such. Thank you!! Hi Katie. Unfortunately, chia jams don’t can well. You can store it in the freezer for a few months, though. Is the lemon juice just for flavor, or does it make a difference in the mechanics of the recipe? I am unable to have any Citrus right now but would love to try this jam recipe. Hi Tanya, it will work just fine without the lemon juice – it’s there for flavor. Enjoy! Hi , do we add the chia seeds as they are OR should we soak them in water first ? No need to soak, just add them as they are! Can I use frozen blueberries for this? Would I need to adjust the amount at all? I don’t care for the maple flavor so going to add honey instead. Should I add the same amount of honey? Hi Donna, yes you would use the same amount. Enjoy! Instead of maple syrup could I use Splenda and maple eXtract? I don’t use any artificial sweeteners but it would probably work. I’d skip the maple extract – the maple syrup is just there for sweetness, not flavor.